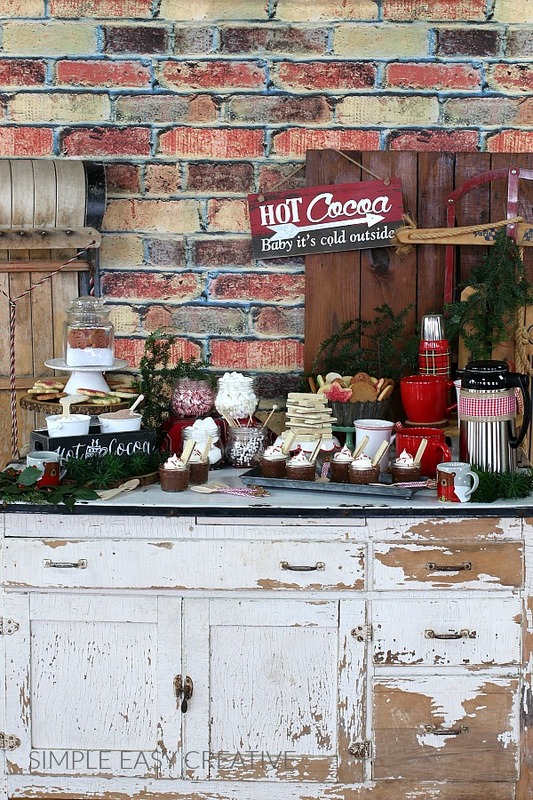 This Hot Chocolate Bar is packed with fun elements that you can easily duplicate to create your own. Whether you are hosting a party or creating special family memories you don’t need to spend a lot of time or effort. 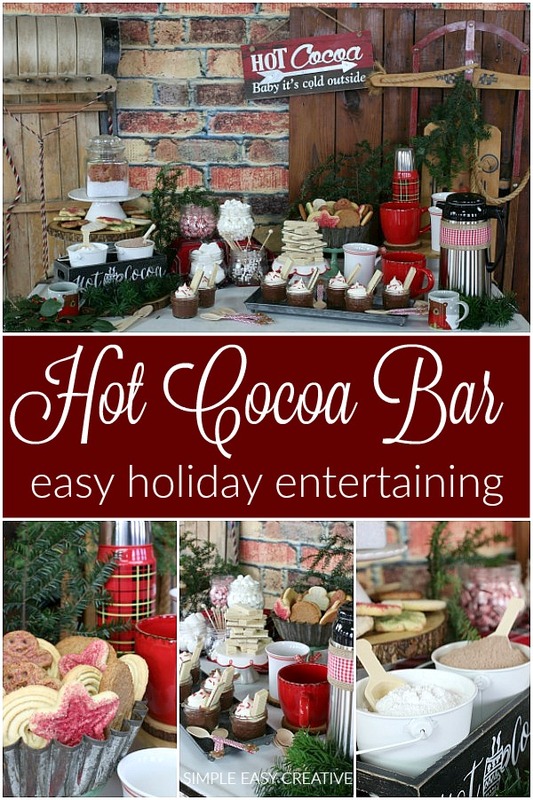 Serving Hot Chocolate and cookies is as easy as it gets. But at the same time, I know you want it to look extra special. This recipe is brought to you by Voortman Bakery. As always, the opinions are my own. The snow is falling, the holidays are coming soon, now it’s time to cozy up with a hot cup of cocoa and a cookie or two. 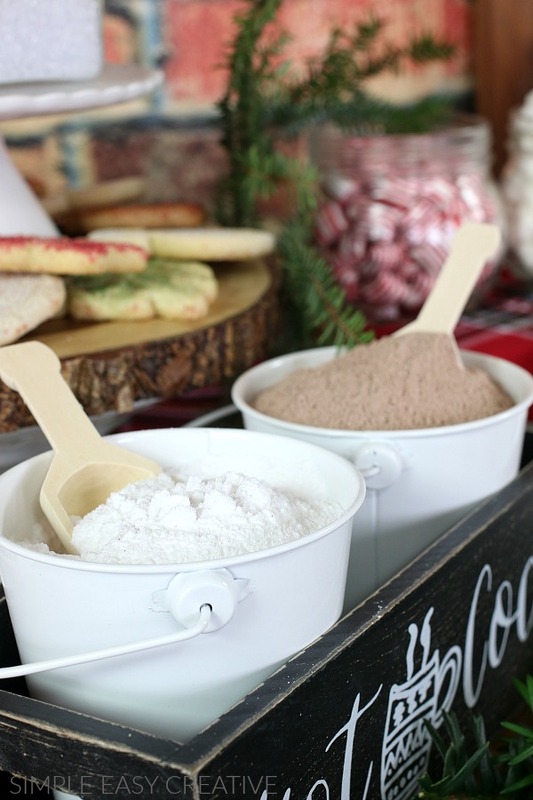 It’s fun to leave the hot cocoa bar up during the holiday season and into January. Curling up with a cozy blanket, mug of hot cocoa, cookies and good book – there aren’t too many other things that are better. 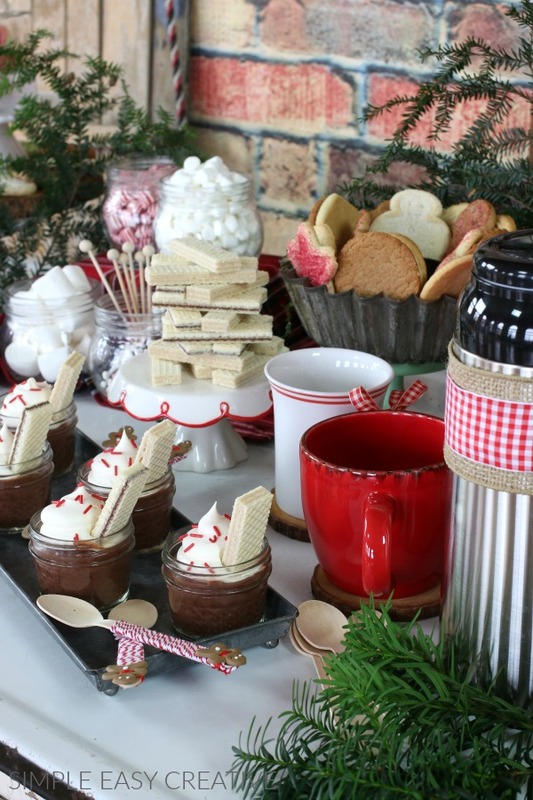 Table – first you will need to figure out where you want to set up the hot cocoa bar. You can use a small table, a counter in the kitchen, a dresser, buffet, really anywhere. We used the bottom of the Hoosier Cabinet. I like the rustic feel it has. You can add a tablecloth, cloth runner, or even a cozy blanket will work. I’m a believer in using what you have on hand and thinking outside the box a bit. Serving – next gather up all the items you need to serve with – trays, cake stands, hot water dispenser, mugs, spoons and containers to hold the cocoa mix and hot chocolate toppings. Display – I like using different heights to add interest and it makes it easier for your guests to reach all the goodies. We used small cake stands with an antique bundt pan to display some of the Voortman’s cookies. And another small cake stand for the wafers from Voortman Bakery. Treats – after you have all the items ready, now let’s add the treats. We kept it super easy with cookies from Voortman Bakery and chocolate pudding. Hot Chocolate Toppings – the skies the limit with toppings. Marshmallows are a must though (in my opinion), we used regular and mini sizes. You can also use a variety of flavored marshmallows if you want. Peppermint candy is also a great addition. Depending on your taste, you can serve a variety of hot cocoa. The white mix is Belgian White Hot Chocolate that I found at a local store, and the other is a traditional hot cocoa mix made with powdered sugar, cocoa powder, instant dry milk, and dry coffee creamer. I like to mix up a big batch at the beginning of the holiday season and store it in an airtight container to have on hand when visitors show up unexpectedly. 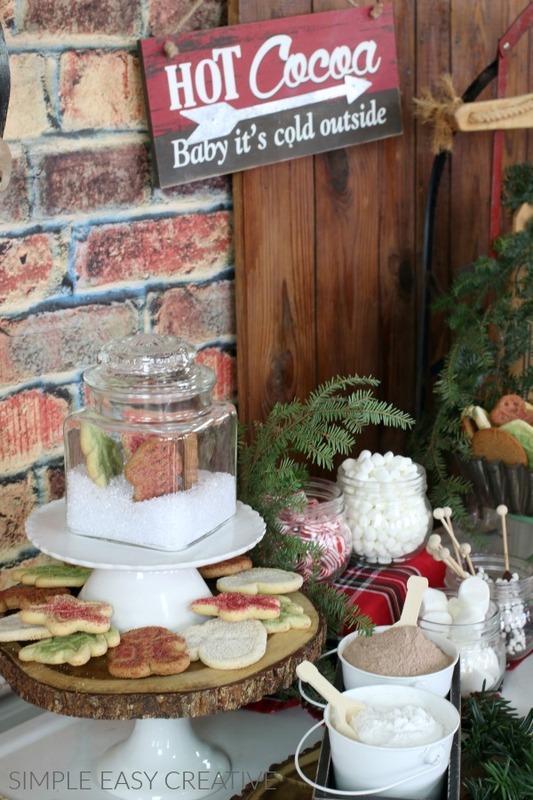 To display the cookies, we used a cake stand and added a slice of wood to the top to give it a more rustic feel. After creating the Oatmeal Chocolate Chip Milk Shake, we fell in love with the cookies from Voortman Bakery. They are made with REAL ingredients, and the bakers believe in the art of baking, believe that cookies should taste delicious and are committed to giving their customers quality, flavor and simply better cookies. 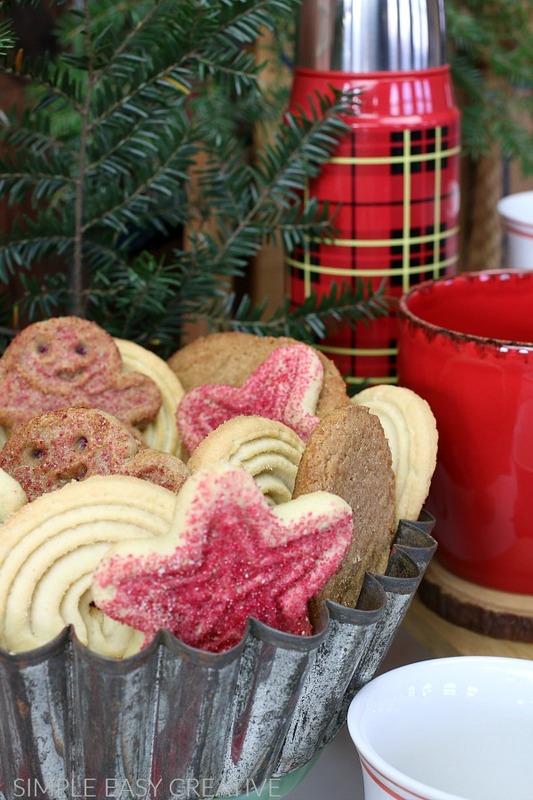 Voortman Bakery has new cookies for the holiday season that includes – Gingerbread, Assorted Festive, classic Snickerdoodles, and Vanilla Shortbread. 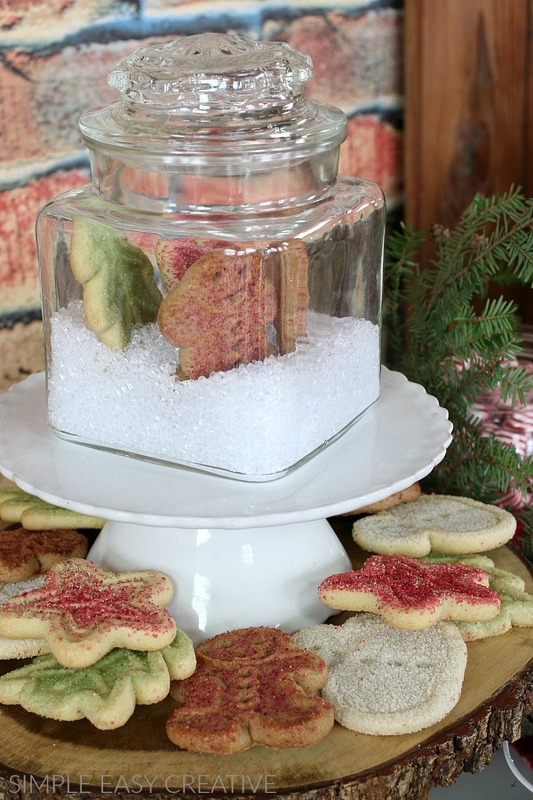 More cookies are added to the jar with “snow”. And sat on another small cake stand to add height. 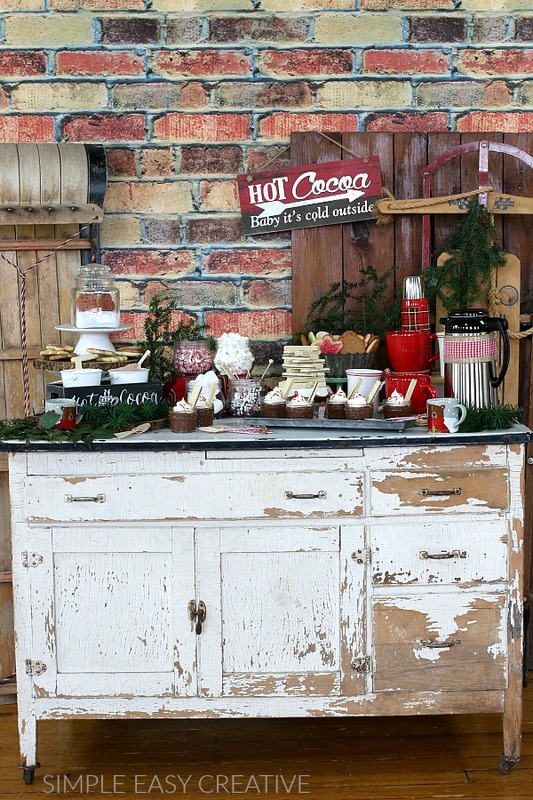 A few pieces of greenery cut from the yard softens the cocoa bar and adds a little color and freshness to it. 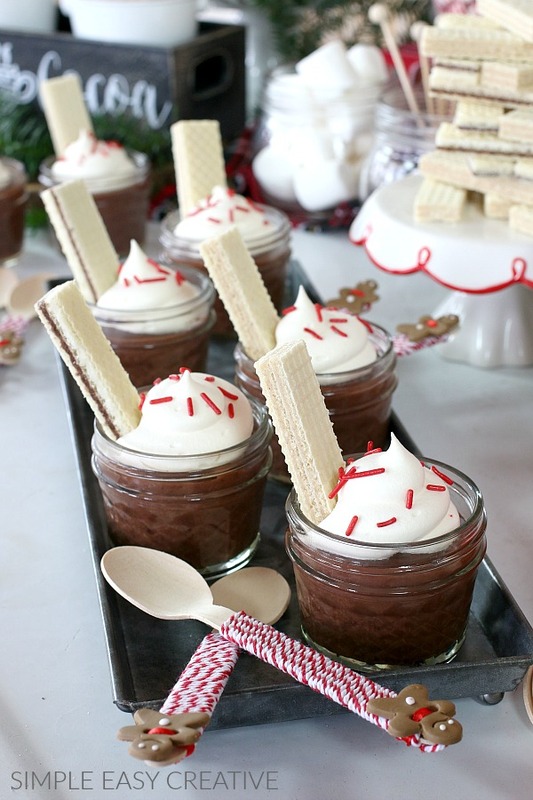 Along with the cookies, we served chocolate pudding in mini mason jars. A dollop of whipped topping, red sprinkles, and a Voortman Bakery wafer was added for a fun and super easy treat! For the holiday season, Voortman Bakery has a variety of wafer cookies, like Chocolate Mint and Gingerbread. To add a special touch to the wooden spoons, we wrapped the handle with baker’s twine and added a tiny gingerbread boy from a ribbon garland. Visit Voortman Bakery for more cookies, and follow them on Instagram and Facebook. What a fun and festive idea! Perfect for the holidays! Thanks so much Jamielyn! I’m excited for the holidays this year! This is such a fun idea. Your entire spread is gorgeous! And now I am suddenly in the mood for hot chocolate. Yum! Thanks so much Kara! It was so much fun to put together! Cutest idea ever, I love it! Get in my belly! This looks so good. My son definitely love this! So glad you like it Erin! Thanks for stopping by! This is such a cute and fun idea! My kids will love it! So excited you like it Anna! Thanks for stopping by!